The votes are in. 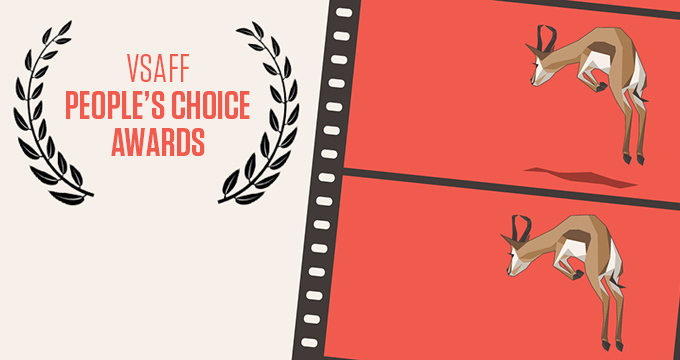 Thanks to everyone who cast ballots, and congratulations to our 2016 VSAFF People’s Choice Award winners! Each year, VSAFF shines a spotlight on an African country other than South Africa. This year it was Ethiopia and the feature film Difret from executive producer Angelina Jolie. Difret is based on the true story of a young Ethiopian girl and a tenacious lawyer embroiled in a clash between cultural traditions and equal rights. It paints a portrait of a country in a time of great transformation and the brave women ready to help shape it. Saturday night’s screening was packed at SFU Woodward’s, and we thank the Ethiopian Community Association of B.C. and the Grandmothers Advocacy Network for their support as Community Partners. The Skype talkback with Difret producer Dr. Mehret Mandefro (who joined us from hospital!) was also a highlight of an enlightening evening. Joost van der Westhuizen was the prince of South African rugby – handsome and charismatic. Glory Game illustrates his triumphs on the rugby field and pays tribute to one of the best rugby players South Africa has ever produced – one of the best players in the world. But fate has no favourites when it chooses victims. Joost is diagnosed with Motor Neuron Disease, a crippling illness that causes disability and death. Where others might struggle to accept their lot, Joost tackles it with dignity — and humour. In his battle against the disease, he fights for his life, he fights for the future of his fellow sufferers, and he rediscovers his humanity. It was a moving and inspiring Sunday afternoon at SFU Woodward’s and we thank producer Odette Schwegler for joining us for a Skype talkback in the wee hours from South Africa. Vancouver neurologist Dr. Andrew Eisen added greatly to an excellent post-film discussion. VSAFFers generously contributed $750 (R8600) for Joost’s J9 Foundation at the door.